Myocardial infarction, also known as a heart attack, can strike without warning. A myocardial infarction occurs when blood supply to a part of the myocardium (heart muscle) is interrupted, either by lack of blood flow, obstruction by a clot, or rupture of a plaque (a buildup of fat and other substances in the blood) in a coronary (heart) artery. Many individuals have coronary artery disease and do not know it until they have a heart attack or die suddenly as a result of myocardial infarction. The January 30, 2008, issue of JAMA includes a study about the use of stents (devices that help to hold diseased coronary arteries open). Men are more likely to experience chest pain during a myocardial infarction. Women often have more subtle symptoms, including fatigue and nausea. Call emergency medical services immediately (in the United States, dial 911). Treating a myocardial infarction quickly is important to limit heart muscle damage and prevent complications. Oxygen, aspirin (taken immediately), and pain relief with morphine (or a similar medication) are usually used in the immediate evaluation period. An electrocardiogram (electrical tracing of the heartbeats) is part of early assessment, as are blood tests looking for heart muscle damage. Other tests may be prescribed, such as an echocardiogram (using sound waves to evaluate heart function), chest x-ray, and coronary angiography (a test using dye studies of the heart's blood vessels). During coronary angiography, the cardiologist may be able to treat the diseased blood vessel using percutaneous coronary interventions, such as a balloon (to open the artery for better blood flow) or a stent. If cardiac bypass graft surgery is recommended, the cardiac surgeon uses the angiographic images to guide the surgical approach. Eat a diet rich in fruits, vegetables, and whole grains. Limit intake of animal fats, high-fat foods, and processed food products. Be cautious about the sodium content of foods, especially with canned, frozen, or processed foods. Control high blood pressure, diabetes, and other chronic medical problems. Keep your cholesterol and other blood lipid levels in the healthy range. 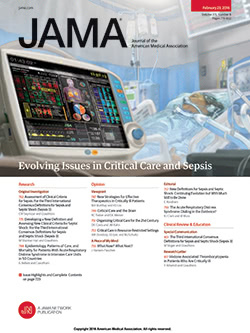 To find this and previous JAMA Patient Pages, go to the Patient Page link on JAMA's Web site at http://www.jama.com. Many are available in English and Spanish. A Patient Page on coronary artery disease was published in the November 24, 2004, issue; one on acute coronary syndromes was published in the August 15, 2007, issue; one on percutaneous coronary intervention was published in the February 11, 2004, issue; and one on cardiac arrest was published in the January 4, 2006, issue.